Railpictures.ca - Michael Da Costa Photo: DH 7303 has been driving railfan’s mad being assigned to the weed sprayer train, last year her sister 7304 played the same duties. 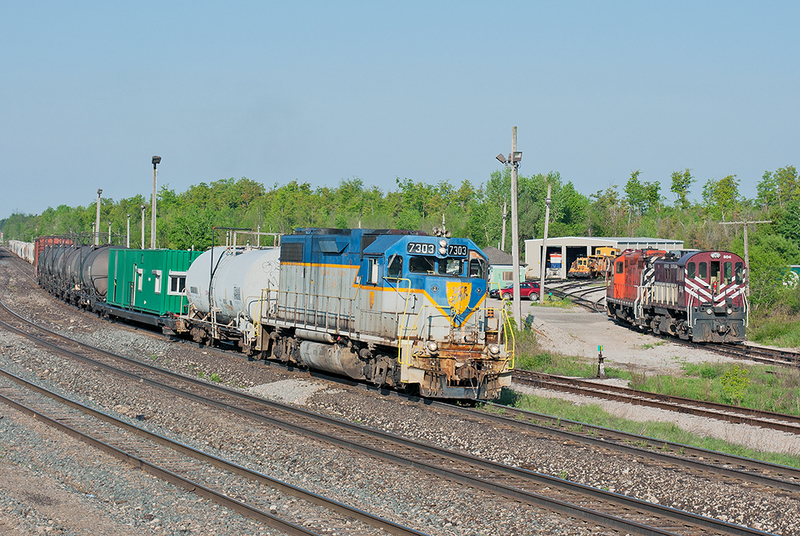 After getting work authority to come out onto the north track, where they will pull clear the mainline switch then back up towards the signal at Guelph Jct then proceed to spray to Toronto, the local OSR job poses at the eastern end of the Goderich Main before heading up with one car to Guelph. | Railpictures.ca – Canadian Railway Photography – photographie ferroviaire Canadienne. Caption: DH 7303 has been driving railfan's mad being assigned to the weed sprayer train, last year her sister 7304 played the same duties. After getting work authority to come out onto the north track, where they will pull clear the mainline switch then back up towards the signal at Guelph Jct then proceed to spray to Toronto, the local OSR job poses at the eastern end of the Goderich Main before heading up with one car to Guelph. Don’t know if someone pointed this out yet or not, but note the 2nd car…last year it was white. It looks like a converted sea can…cool! Send it out west !